America & Beyond is a lifestyle brand that enriches everyday life of a woman with fashion handcrafted in rich ethnic embroideries and exuberant prints. We are a family business originating in the U.S. in 2015 with a strong background in women’s fashion and a successful manufacturing company in business over 25 years in India. We pride ourselves on our uniqueness as our factory works directly with craftspeople in villages and small communities and provides them trade to give them sustainable independence. America & Beyond collections feature clothes, handbags, and accessories made with hand-loomed cotton and viscose fabrics, hand-woven jacquards and durries, and artisan hand-printing techniques. Our shoes are made in 100% genuine leather and hand-embellished with intricate details. We design and manufacture in-house, source materials ethically, and are dedicated to delivering keepsake quality. We are passionate about connecting contemporary designs with a network of craftspeople, creating unique collections to be cherished. At America & Beyond, all of our products are hand embellished in India as we work with an artisans community and help support their families. At this show we are going to be shipping out all of our orders in the following week allowing you to have everything for your store almost immediately! This is a fabulous opportunity for you to bring in some new, one-of-a-kind products into your store! Add some plant power to your everyday fashion with our San Pedro Resort Wear Collection. Made from jute durri, this cross-body has a drawstring fastening with tassels, round handle wrapped in cord and a long adjustable strap. Draw the attention to your holiday look with our colourful and sparkling collection. 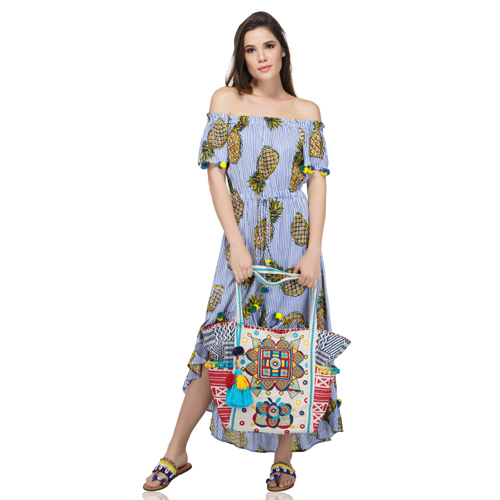 These bags have a geometric pattern topped with vibrant indian ethnic embroidery and mesmerising embellishments of beads and sequins with mirrorwork.